How to become a better player or maybe a 2k player?. To answer this question we will try to explain a variety of different techniques and basics about CBA. Following this guide you too could become an expert player, although it will take some effort, but if you are dedicated and focused I can promise you following this guide will improve your CBA game and enjoyment. Unfortunately, many players do NOT know or use most of these skills and basics needed for CBA, and they can lose while make mistakes. This Guide is all about team games. It does not cover 1v1 games specifically but good skill and technique will help in all the games you play. First we will be explaining one of the most important skills in CBA. There are many different ways to take a raze , most of the time you will need an cavalry civilization like Huns , Persians etc,. (or) a strong ranged civilization like Turks , Spanish or Chinese etc,. to help you raze a building. Here are some very important techniques that you will need to practice until successful, once learned they will become second nature. 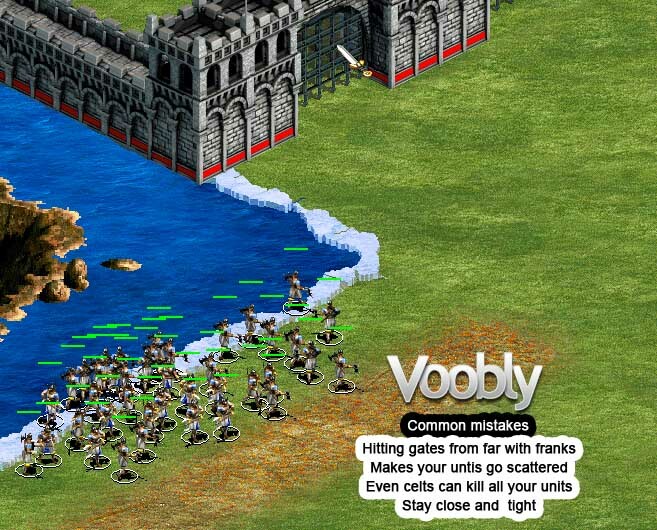 How to make most of your units hit a Gate? Importantly this is about the correct moment / timing and fast response to catch the gate while it is open. This method should get 30-40 units hitting the gate at once, which is a much faster way to raze and obviously MUCH less feeding ( spending less time attacking the gate = less units you lose ). If you are attacking an archer civ you can hit the gate once, run back with your units and this will drag your enemy units - if he wasnt looking - to open the gate. Then sneak back in to the gates but be fast though, the gates dont wait for you. - If gates are closed. 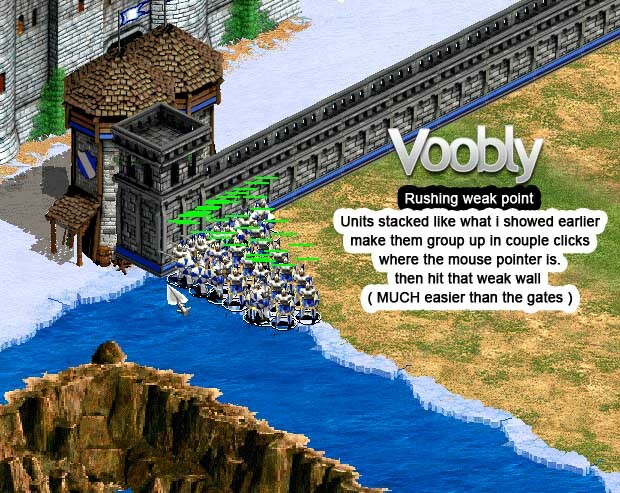 This is a very clever method to hit a gate with the maximum amount of units actually attacking. Try to get your units to align perpendicular on the Gate (at an angle). Most expert players can do this in a maximum of 2 clicks so practice makes perfect. You will certainly need multiple clicks at the beginning to get this correct. If you attack the gate in the normal manner ( depending on the civ - except for Huns ) you can do a maximum of 80-100 HP damage per hit with the amount of units actually hitting. Using this method you can do at least 200-300 HP damage per hit ( 2x , 3x Faster ). This is one of the most important skills in CBA. 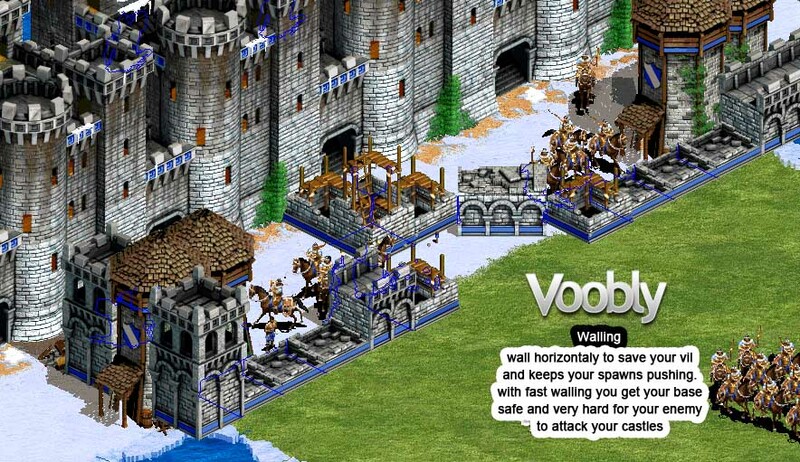 Most players will wait for 20 - 30 or a full group of units before sending. This is a really big mistake most of the time , in most games your allies could be in a bad position and end up fighting 4v1, so you need to send your units out as soon as you get 4-8 spawned. This will avoid your allies being left 1v4 etc and could give you the advantage of 4v1 in your favour. This is really important and will determine who is going to control the game play. Send out units while patrolling ( we will discuss this later ) and not just to a map position - you could lose all of your units if you just send them to a spot and there are enemy units in your way. Same goes with reinforcement , you have to keep sending the 4-8 units asap as IDLE units kill your team. A very important factor in battles is using a shield ( another player's units) and controlling your army, don't allow units to run all over the battle, KEEP CONTROL. Shield example :If you are an archer civ try to always be behind another strong shield civ Persian , Byzantines, or Teutons or just any infantry civ because all inf/cav civs have higher armour and higher hit points than most archers and you definitely need to use that advantage but make sure you dont get Flanked! Flanked is being surrounded from both sides by enemy units while trying to hit and run. Try to avoid that as much as possible, or Patrol your units very tight and click S ( Stop ) so they dont patrol any more , Stand Ground is preferred with this as well. Scouting and sneaking are very distinctive skills. They are mostly Offensive / Edge skills. A good tip is to scout while walling your gates. Put 3 - 5 units on the sides of your gates on defensive stance to make sure it's safe for your vills to wall. Also make sure your villagers are on the inside of your gate. When they are building from the inside they are much safer and easier to hide. You can use ( or any ally with good view range .. like brits or Turks .. ) 4 - 5 units to patrol on no attack stance ( o button ) in the middle of the map , you can put them randomly. but it will give u great view of the map.. specially if you are against many rushing civs. like viks / celts / huns / japs. . if they are coming for you. you will know it and will be ready ! Celts , byz or Maya are really the best civs for this job. Try to keep your enemy on their toes when they have villagers . They will always feel insecure about their villagers knowing they might die any second. Although you may fail killing the villagers it really buys you a lot of time and stops his build speed. Making him run for the castles every time to evade your attack means he is not building and will give you some advantage or time. huns are very good civ for kills 2.. they beat many other civs if u know how to use them. you need to have to have kills.. for example.. if you are vs mainly archers .. you can get a lot of kills and be the 1st to Imp.. and you can give your mates the game much easier than if you only rushed and fed the opponent team. You have to learn how to micro. how to hit and run.. how to make ur enemy SO confused, make unexpected moves.. open everyone . make them agitated , they will be confused and you can get as many kills as you want because they wont be able to play in team. With regards to patrolling I cannot do a better job than what Geen did with his amazing guide. for Patrolling information ( Which is Crucial guide) Without patrolling you are 13xx , 14xx player. with patrolling you are at least 16++ player. There are many things to learn with this stage of the game. This will include what units each civ should make. What would you do if you got countered. etc etc. Without good team work even if you have a HUGE civ advantage, I can guarantee you it's easy to lose if your enemy is playing as a team. I can show you many examples but I don't need to, I'm sure you have lost many games that you thought you had civ advantage in, so you all know exactly what I am saying here. Never play solo. Try to follow - or be a leader ( if you are good enough ) , lead your team to win. Do what you think is best but remember 3v1 or 4v1 is much better than going solo against another player.. 1v1 can be lost or won.. but 3v1 you should always win. " But make sure the guys on edges next to dangerous civs gets protected as well. Your team ( all players ) should play as one unit. Communicate with them, make sure everyone knows WHO is taking the first or next raze , make sure that the right people get walled first and units are always guarding the right base. You need to use the most of your base to maximize your production and speed without units getting stuck. An example would be Chinese and you need 50% camels and 50% heavy cav archer. You need to make your base look like this. This will give you 8 archery's and 8 stables. You can put a blacksmith for faster upgrades and this could even prevent / stop units from rushing you from this side and also earn some time if you are walled. When you build outside your gates try to be careful not to expose your villagers. Remember always build fully inside your base before going outside. Always keep your buildings stacked together not to lose build space ( this is very important in imp wars - [You must login to view link]- and to be able to reach them much easier. Keep your buildings stacked ( as shown above ) and put your villager in the middle and let it build. If you are rushing the player who has walled perfectly. Of course you wont be the only one rushing. The first weak point that most players do not notice is this. Aim for it . You can use the same technique explained earlier about razing. Stack your units on the side with a couple of clicks to make them look like this. If you are the one being rushed and you don't have much time to wall. If you are being heavily rushed you can wall piece by piece, just trying to use as much space as poss. Walling on an angle until you can safely gain enough space to wall. Here are some good screen shots on a fast wall. One villager keeps transporting from the front of the castles and the back of your castle. Push your units up a little bit by bit until you can safely wall fully but don't forget to secure your weak point. Sometimes you dont even need to Wall! sometimes you need only to build. Blocking an enemy spawn while rushing is very important, especially when attacking a strong enemy and you have weak units. 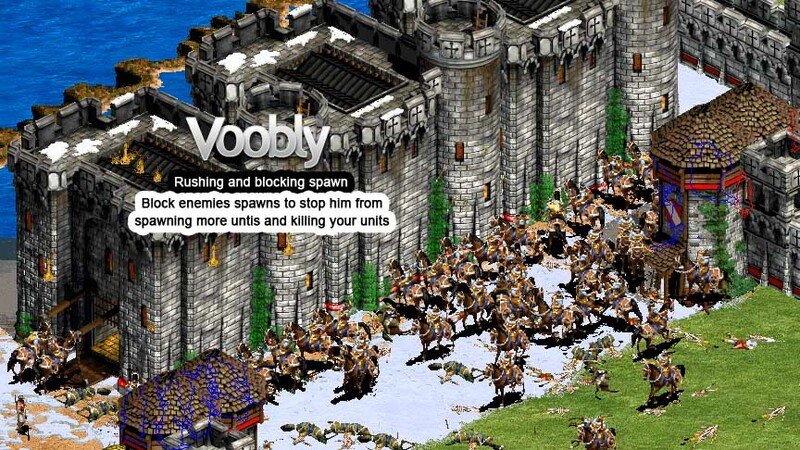 By attacking the front of the castle your enemy would be losing population without creating new units. This is a very good chance for you to kill their castles. If you have killed one of the middle castles, defending the rest would be VERY difficult for your enemy. He would be totally open and very vulnerable to your rushes. Sometimes it's not the best idea to block his spawn, as all 4 of the casles can hit you, sometimes it is just best to go to one of the sides and rush the castles, because until they research murder holes the castle you are attacking can't hit you and the one on the end usaully can't, so only 2 out of 4 castles can shoot you. This also depends on how strong your unit is and how strong the enemy units. e.g: Huns cant do that to japs unless! japs base is totally empty then you can kill him in 2 mins. If you are Mongols / Spanish / Sara Make a Stable and upgrade your Bloodline first. Bloodlines is an icon that looks like this. This adds 20 HP to your units and can make a big difference. If you are Turks / Spanish / Mongols or almost any other archer civ make an Archery range ( with the bloodline ) and upgrade your Thumb Ring. This adds accuracy to your archers. 1- The most common mistake players do is when trying to raze they click the gate from too far away. This is very bad with any infantry civ and most short ranged units like Franks or Sara. If Celts are attacking the Gate of Britons and you have Turks supporting the Celts from behind. The Turks is preferred to attack the units rather than attacking the gates and let the Celt hit the gate. 3- Idle units is another very common mistake. As previously stated keep reinforcing. 6- Making the wrong buildings. If you are Britons vs Goth , you cannot make 8 archery ranges and 8 stables.. it should be more like 12 stables and 4 archery ranges or none even. It depends on how good your enemy is. 7- Castle targeting : when a player is being rushed he does not control his castles to shoot at specific units. Most of the time you need to target the archer / ranged covering civ as they can harm your vills ( if you have razed ). 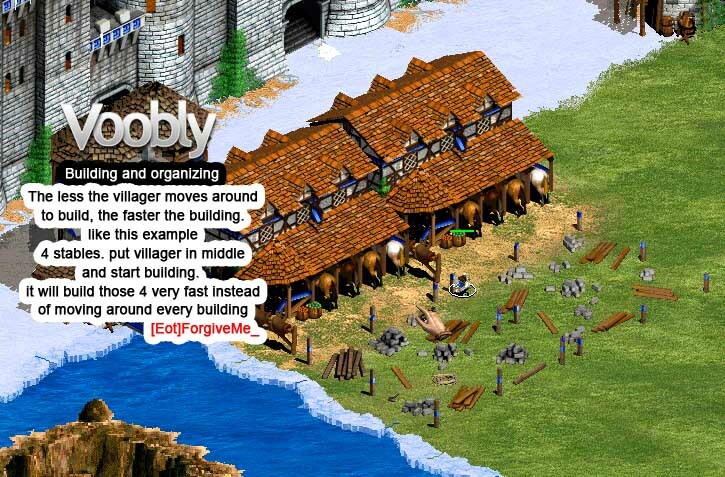 Hint : name your castles + your 4 Towers with CTRL + 1 so when you are being rushed. hit 1 and target on your enemy unit. 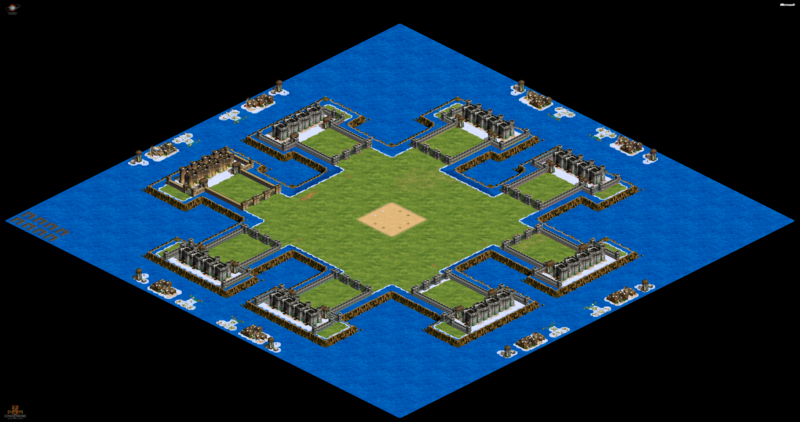 8- Walling when you are against all NON rush civs.. or weak ones. so for example you are vs , maya kors franks and spanish.. I'm sorry if i forgot anyone! but Thank you! Each and every one of those players listed above have reviewed this Guide and Added something to it. So a huge thanks to them for taking the time and showing interest to help others. I took the liberty to pin this topic since it took so much time and effort by so many people! This doesnt Cover EVERYTHING in CBA. Good job on the guide eT. good job john let's hope the cba community take something from this !! Just read and learn something. Much Needed one. Thanks a lot. Came in right time. Actually u need to use two numbers. I mean Crtl+1 for two castles+two towers on one side and Crtl+2 for two castles and towers on the other side. Except for teutons, other civs dont have that much range. Only three castles are gonna shoot at the units that you choose. While the 4th castle will be out of range and hits random units.